The Adelaide International and Domestic Airport Terminals are conveniently located in the heart of the city of Adelaide just a short distance from the city centre and the beachside suburbs of Glenelg and West Beach. So if you are looking for a hotel or serviced apartment close to the Adelaide Airport then you will be able to find one here. Airport Hotel allows you to choose from a number airport accommodation options and be able to get discount rates for short and long term stays. By choosing to stay in Adelaide at the Oaks Liberty Towers Apartments you will have the best of both worlds, quality beach front living with all of the advantages of the relaxed waterfront lifestyle that Glenelg offers and convenient access to both the Adelaide Airport and the Adelaide CBD via a leisurely tram ride. The Oaks Liberty Towers Glenelg has a wide variety of one, two and three bedroom apartments that are all fully self contained with stylishly appointed fixtures and fittings, which is what makes it the ideal apartment accommodation for leisure, business and corporate guests. One of the best things about staying at the Oaks Plaza Pier Apartments in Adelaide is that you can choose your accommodation from a wide range of room types including studio, 1 and 2 bedroom serviced apartments. 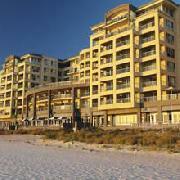 The property also has excellent hotel facilities including two bars, three dining areas, an indoor swimming pool, spa, sauna and well equipped gymnasium, as well as being conveniently located next to the Glenelg beach and just a short distance from the Adelaide Airport, golf courses, the Jurlique Day Spa and the Adelaide city centre. The Adelaide Sorrento Meridien Serviced Apartments in conveniently positioned on tree-lined Anzac Highway about halfway between the Adelaide CBD (5 minutes) and the Glenelg Beach (8 minutes), as well as being only 3 minutes drive from the Adelaide airport. 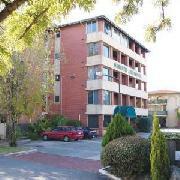 The Adelaide Sorrento Meridien Apartments in Plympton has a range of 1 and 2 bedroom fully self contained apartments available for either short or long term stays in Adelaide. The property is located close to Morphettville Racecourse and the freeway to the Southern Fleurieu Wine regions, making it great for single travellers, couples and families. If you are looking for beachfront apartment accommodation in Adelaide that is just a short distance from the Adelaide airport then the Esplanade Apartments is the perfect place for you. Guests who stay at the Esplanade Apartments in West Beach will be able to choose from a number of fully self contained 1 & 2 bedroom apartments that have everything that you need to feel right at home. 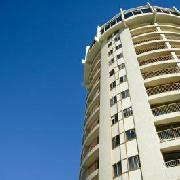 The property is located close to the beautiful beach and there are a number of other services located close by. There is even a regular bus service that operates between West Beach, Glenelg and the Adelaide CBD. 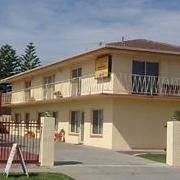 The Atlantic Tower Motor Inn is ideally positioned in the heart of Glenelg right next to the city's famous beach and within easy reach of the many things to see and do that Glenelg is known for. The Atlantic Tower Motor Inn is in the ideal location for leisure and business guests alike because it is conveniently situated only 5 minutes from the Adelaide airport and 15 minutes from the Adelaide CBD. 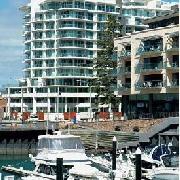 Also within each walking distance from the Atlantic Tower Motor Inn are a wide selection of quality restaurants, the historic Glenelg Tram to the CBD and the many bars and night clubs along Jetty Road. Hotels and Motels located close to Adelaide Airport offering special discount accommodation for stays longer than 1 night. You can book your airport accommodation up to 12 months in advance or at the very last minute.